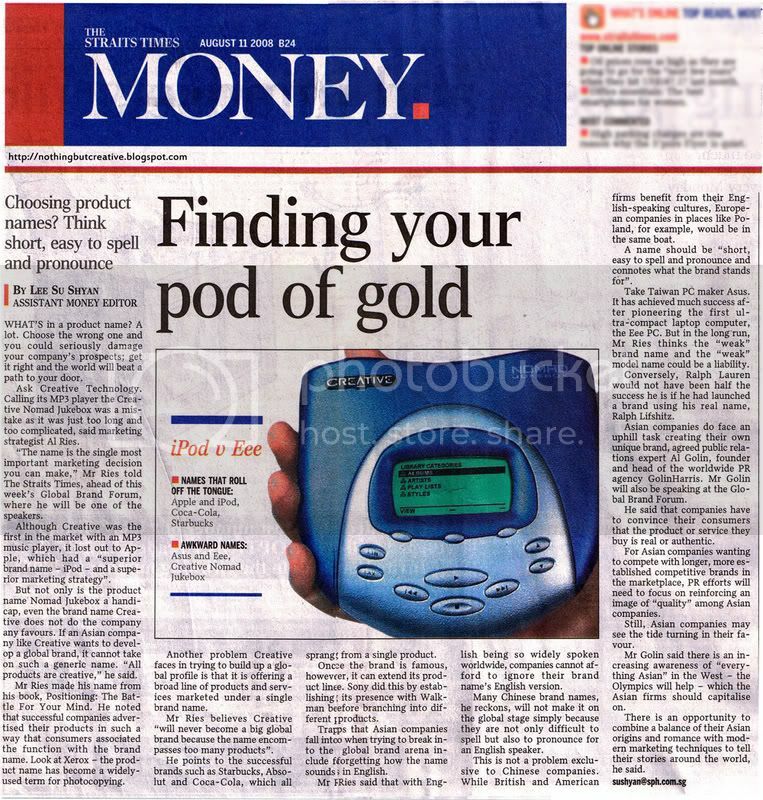 I came across this article in the newspaper which was talking about branding and thought that i should share it with you guys. One example the article cited for bad branding was Creative. Marketing strategist Al Ries (No, never heard of him before) who said that the naming of the product is "the single most important marketing decision" a company can make, described the Creative Nomad Jukebox as a mistake as it was too long and too complicated. Even Creative's brand name was criticized as "too generic" and that "All products are creative". He conveniently left out that Apple itself is also too generic a name and perhaps it even confuses people into thinking that it is a ... fruit company? He further went on to say that he believes Creative "will never become a big global brand because the name encompasses too many products". That my friend, will hopefully Change ! This article is quite bad, IMO. Many of the world's biggest corporations have similar, if not worse, names. Big ones: Ford, Dell, Disney: all very creative being named after the last name of their owner. The iPod name is just as good (or as bad) as the Eee. People just have to get used to it. A few years ago, iPod was a dumb name. Now that everyone has one, it's not so stupid after all. Nomad was actually brilliant: if you think about it, nomad means wandering, portable, genius really for a portable Jukebox. People (especially for marketing strategists, who make a living out of saying what everyone thinks publicly) were just too dense to get it. 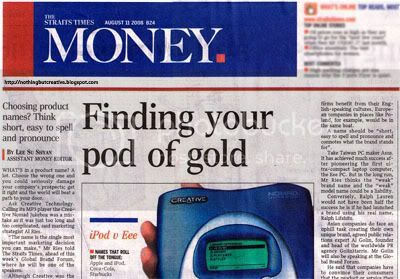 iPod, really was just an invented word.